Just after the launch of the Touch Diamond on Alltel's network, the Touch Pro celebrated its launch on their network today. The device comes equipped with Windows Mobile 6.1 Professional, a 2.8-inch VGA screen (640 x 480), a 3.2 megapixel camera, the increasingly popular TouchFLD 3D interface, and stereo Bluetooth technology. If you're prepared to pluck down $379.99 (before a $100 mail-in rebate), then the device can be yours. i totally agree this one looks a lot sleeker, smoother and just overall better looking. arent sides of a phone normally rounded? I agree. I have been with Alltel for a while. I had my eye on this phone for a while now. When I heard of the merger, I ordered the phone from Alltel almost immediately. This way, once Verizon does take over I will have this version of the phone and not the hideous one from Verizon. For the record-YES! The Alltel version comes with WiFi. The only negative I have is the battery life stinks. Hmm, why Alltel? 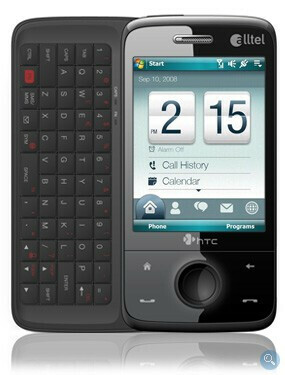 Verizon is aquiring Alltel, it seems pointless for new devices to be available for Alltel. this version is better than Verizon's, where the accelerometer is gone, and touchflo3d is missing. Att&t aquited cingular and they still made cingular phones, for awhile at least. TF3D is still on the VZW version dumbass. The accelerometer is not gone, it still rotates the screen. What you are referring to is the Motion-G accelerometer that does other mothions than up/down, left/right (aka portriat and landscape, i thought i would include this because you are stupid). So i do agree to an extent. If you are on alltel, buy this device, then when vzw finally acquires alltel you will get a better device an a real network. It is a smart move! not rlly, when att took cingular, any phone with the cingular name on it was stop being manufactured with the cingular name on it, so it was being sold, but it was on hand quantity only.